Though for a time those of us who spend the winter on the island were wondering if a thaw would ever come, it finally did and the PABI Ice Classic Buoy slipped into the cold waters of Paradise Bay on Saturday, April 13 at 11:28:30 a.m. Phil Wycoff was the Ice Classic entrant with the best prediction on the time, so he takes home half the entry fees. Phil isn’t the only winner, though. everyone wins because the other half of the fees goes to support your Beaver Island Community Center and WVBI. Have you made your reservations for the Beaver Island Community Players production of ’til Beth Do Us Part? You can see the show Saturday, April 27 at 8pm or Sunday, April 28 at 3pm. Tickets are available at the BIC Center Front Desk or you can cal 231-448-2022 to make your reservations. Last year’s spring comedy was a near sellout, so don’t miss your chance to see this year’s show. With the spring thaw comes time for the PABI Road Rally. Don’t get left out of the fun. Form your Road Rally Team now or call the BIC Center to get added to an existing team. Details are on the WVBI/BIC Center Community Calendar. Our regular weekly events continue with Pickle Ball Tuesdays and Thursdays from 9:30 to 11:30, the Arthritis Foundation Exercise Program on Tuesdays and Fridays from 10 to 11, and Games Galore Thursday afternoons from 1 to 4. And, there are movies every Saturday at 4 and 7 (except when there is a show in the house). Check here trailers and details. We look forward to seeing you at your Beaver Island Community Center. What’s at the BIC Center? The Ray & Ann Stanhope Visitor Center is a great place to get information, grab a snack, connect to Wi-Fi and kick off your island adventure. 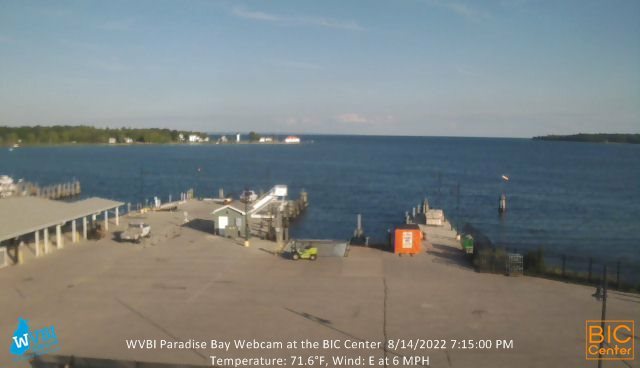 It’s also home to the island’s community radio station…our very own WVBI-The Voice of Beaver Island. The McDonough’s Market Theater is the premier performance space on the island hosting music of all genres, dance, theater productions, movies, seminars and community meetings. Carol’s Hang Out upstairs offers an informal gathering place for meetings, reading, pool, foosball, board games, video games, TV, using our community PCs and printer, and … just hanging out. The summer of 2018 kicked off with a road rally, student theater and BICS graduation and continued with music, plays, special community events, yoga and more. Our scrapbook from May to September is here for you to enjoy while we plan another summer to celebrate in 2019. The winter of 2017-18 was packed full of great movies at the BIC Center. Watch them sparkle by to the right. Anything you'd like to see again? Let us know. And let us know what you'd like to see this summer. We'll have movies at 3 and 7 Saturdays, at 7 on Tuesdays and at 3 and 7 on rainy days. Watch biccenter.org for the latest. The summer of 2017 was truly one to celebrate at the BIC Center--with plays, music from many genres (Classical, Jazz, Celtic, Folk and Country) informative presentations, the Summer Solstice Party, the 2017 Gala, Yoga, tech presentations, rainy day games, trail head information and more. We're planning a similar flurry of events for the summer of 2018. Summer 2017 was big for movies on the big screen at the BIC Center. We presented two movies every Saturday all year and started movie Tuesdays during the summer. Watch them sparkle by to the right. 2018 will be another great year for movies in the Robert Gillespie Memorial Theater. PABI's spring events included two productions in the Ray & Ann Stanhope Theater, a robot film festival and the classic Ice Classic. Car #1 Was #1 Again! The winning team of Diane McDonough, Andy Kohls, Eric Hodgson, Jeanne Gillespie and Kathy Speck has not only Rallied for over a decade, but in past years has organized this PABI annual rite-of-spring. Congratulations for winning the coveted trophy--and continuing a Beaver Island tradition! You can help us deliver quality community events and entertainment at the BIC Center and on WVBI by making a contribution.